Fast Glass. For many photographers, a lens that has an aperture of f/2.8 is pretty fast. But, you can go faster for a price. Canon has a two L-series lenses than have an aperture of f/1.2 (including the amazing Canon 85mm L). Even Sigma offers two lenses with an aperture of f/1.4 (like the best 50mm for the price). But, what does this fast glass really offer? In one word – bokeh. Bokeh occurs when objects are in the frame but out of the depth of field. As a result, these objects in a shallow depth of field are blurred for a loss of detail. Objects become dabs of color and lights become ethereal balls. 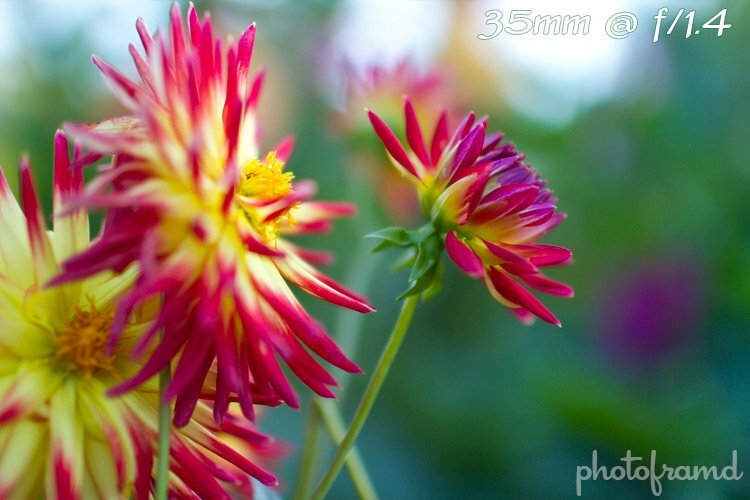 When used correctly, bokehs are stunning and put more emphasis on the subject in focus. 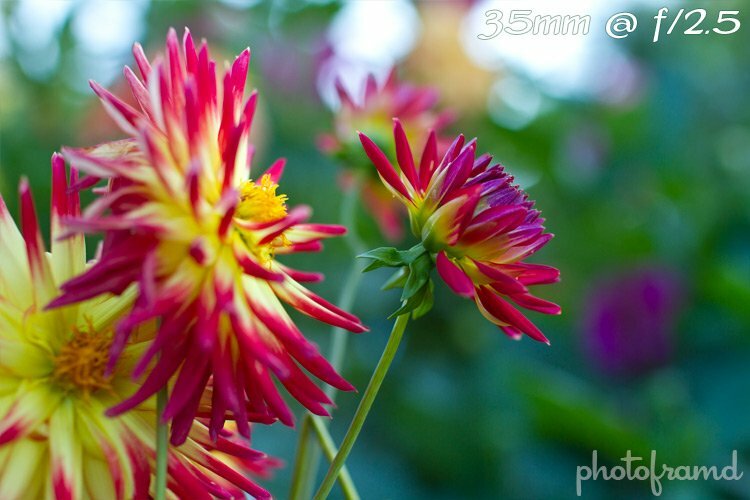 Take a look at the following set of photos taken with the Canon 7D and the Canon 35mm f/1.4 L.
The focus remained on the dahlia on the right. The Canon 7D was in AV – Aperture Priority Mode. By spinning the Main Dial on top near the shutter release, I quickly changed the aperture from f/1.4 to f/6.3 while the 7D selected the appropriate shutter speed. The obvious difference is in the background, buttery smooth at f/1.4 and blurred details at f/6.3. 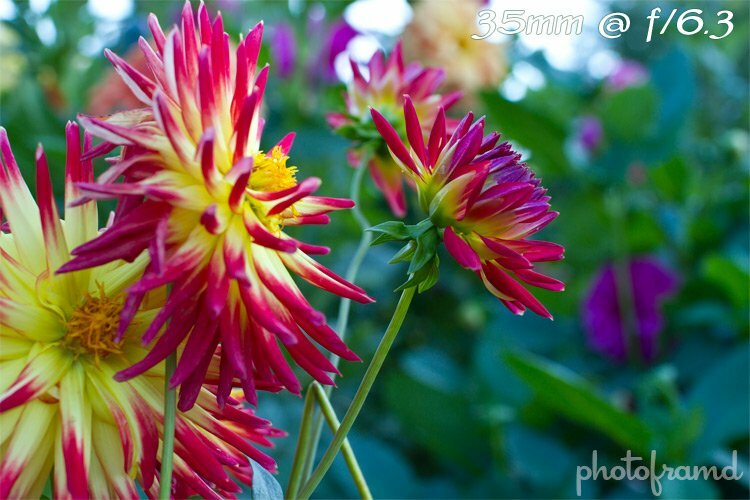 But, take a look at the other dahlias in the photos. They are also effected by the change in aperture. If I had to choose, I would say the f/2.5 is the best balance of detail in the foreground and bokeh in the background. In general, I use either an f/2.0 or f/2.5 when I am trying to achieve a pleasant bokeh while keeping the main subject in focus. It’s a fun aspect to explore. 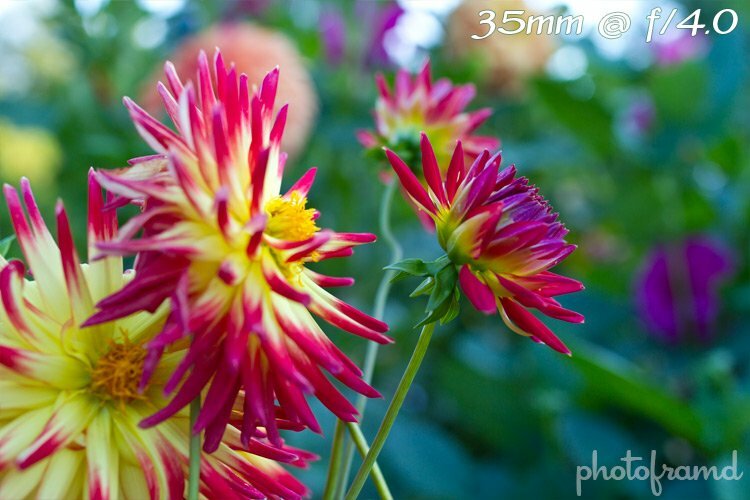 Just remember to take multiple shots at various apertures to be sure that you get the best shot.